UPDATE: If you want to read what we’re reading, check out our complete book list on Amazon. 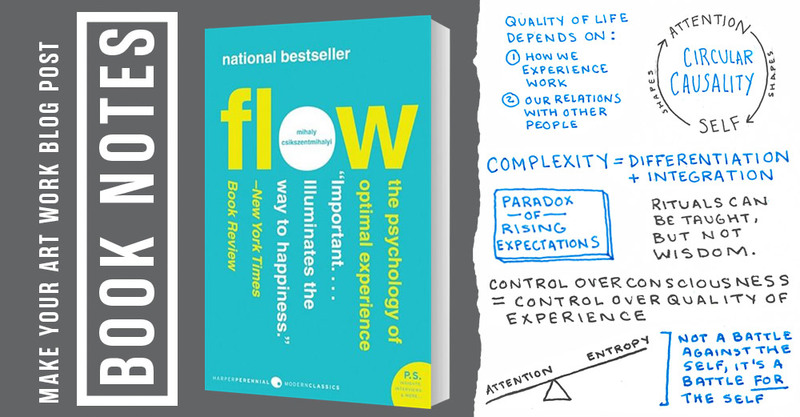 Flow, the Psychology of Optimal Experience was one of those books that’s been recommended a ton of times, and it was sitting on my pile for a while, but once I finally picked it up and got 5 pages in I kicked myself for waiting even a moment’s delay. It’s that good. 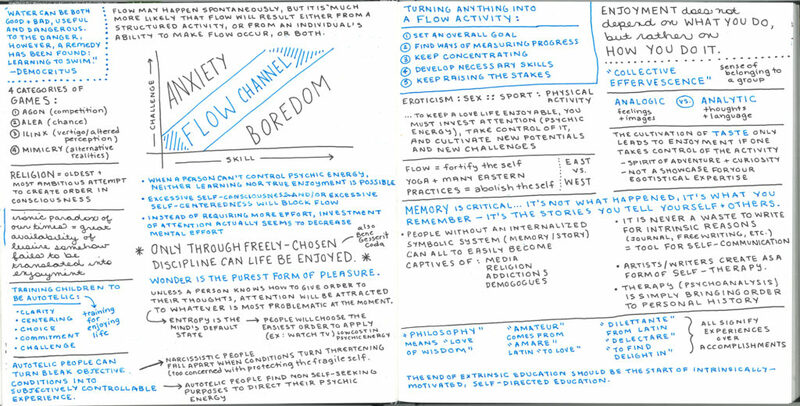 If you have ever been “in the zone” or, as the author calls it, “flow” in any activity (art, writing, cooking, sports, physical activity) you know the joy of getting completely absorbed in what you are doing. You lose sense of time, you lose sense of effort. Everything seems to work together. You feel lighter, faster, smarter, more clever. Don’t we all wish we could work in that mindset all the time? But doesn’t it feel like completely unpredictable magic? Sometimes work is an effort, and sometimes it’s a joy. The author calls this “flow” state an “optimal experience” and breaks down exactly the conditions needed to get into flow, and maintain it. But this is not just a matter for enjoying work and performing at your best — this is about the pursuit of happiness itself. Although the author goes to great pains to deny that this is another “how to be happy” book, that is exactly what it is. The scientific breakdown of how to feel fulfilled and purposeful, which is, in effect, what “happy” really is. 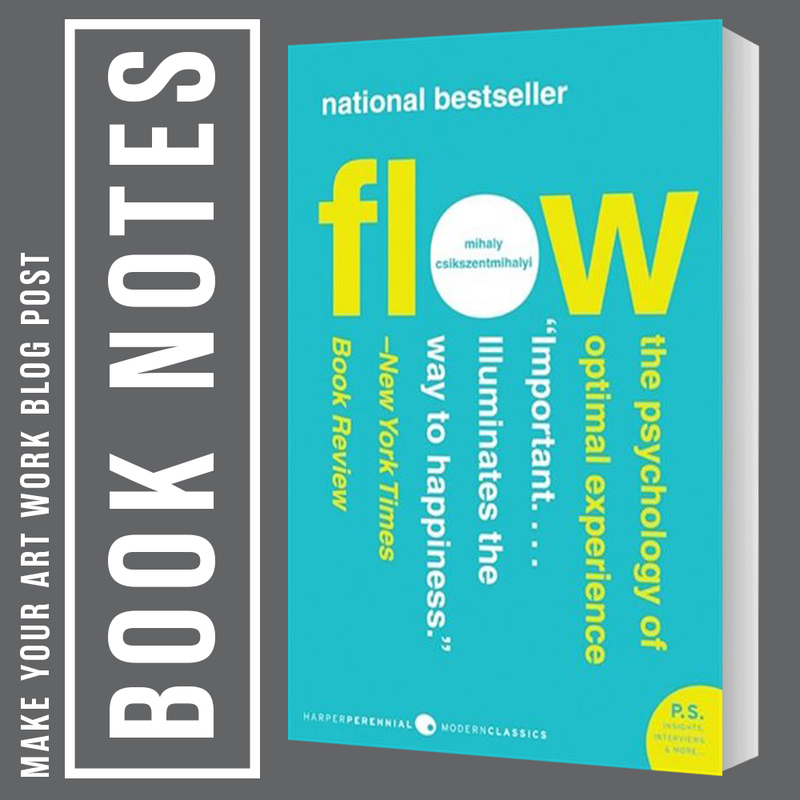 Flow is the art of optimal experience, and anyone who can control their ability to have optimal experiences is called an “autotelic personality”. This book has so many takeaways I’ve written more notes than any other Book Notes post, and that’s saying a lot. 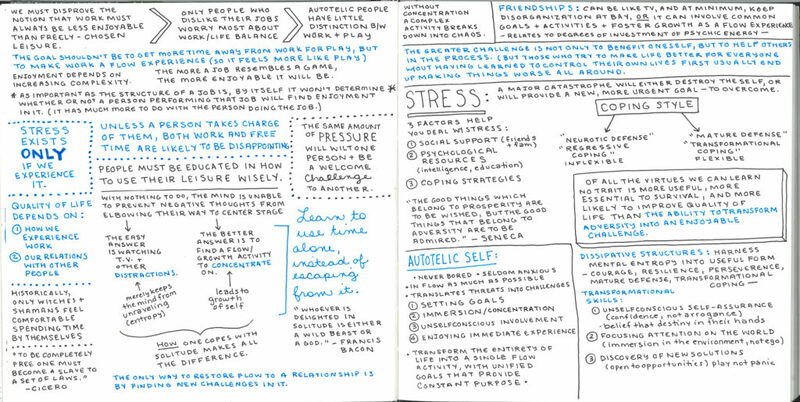 There’s just so much valuable material, especially for artists. The ability to turn any activity into an “optimal experience” is pretty simply a key to unlocking that magic creative place we all try to achieve every time we start work. And even though it’s not that easy, it IS simple to understand. There’s 5 basic conditions for flow (see the notes above) and once those are met, then flow is automatic. But then there is so much more in Flow. There’s a fabulous section in the second half of the book about stress and frustration and overcoming hardship that could easily be a book in itself. I only had to get halfway through this book to start telling many people about it. I even, no exaggeration, ordered a copy and mailed it to someone I know who needed to read it immediately. When I got three quarters of the way through I ordered his second book, Creativity, because I knew I would want to go straight into that one (a future Book Notes post for sure). If you want to know more about his findings and the psychological research behind it all, then check out his Ted talk. But, a warning: his ideas are there, but it’s not a great one. The ideas come across much better organized and easy to digest in the book, so don’t let the talk scare you away. But it’ll give you the general gist. And it’s no coincidence that this Book Notes follows our last one on Big Magic by Elizabeth Gilbert. These 2 books taken together are exactly what you need to get yourself out of a rut and back to creating and feeling good about it. Background on the “notes” part of Book Notes: When I am reading a book, I am a obsessive underliner (especially of non-fiction books). After I’m done, I copy anything I want to remember into my sketchbook. It’s kind of like making personal cliffs notes. This column started because many of the people who have seen my sketchbooks over the years wanted access to some of the pages on books they were interested in. Since I am reading books through the lens of an artist, I wanted to start sharing these notes and condensed reviews with other artists. If you like the tone of the notes, then you’ll know it’ll be worth it to pick up the book. This is awesome!! I have been wondering about getting this book, and now I see I don’t need to wait a moment longer! <3 Thanks so much for sharing! I’ve been wondering about this book too. Someone mentioned it to me but I didn’t realize how choc full of helpful info it is. Thanks! I’ve been making my way through Creativity. It’s pretty interesting. He gets into some of the why of creativity, and who decides or what makes something or someone creative. He brings up interesting points on the system of creativity, it’s interrelated parts (domain, field, individual) which to me kind of touches on the gatekeepers of a profession. I a bit over half way through. Good stuff if your wondering about where creativity comes from or what makes a person creative. I’m just about a quarter of the way in and it’s really fascinating. What I really liked about Flow is how he broke up this “magical” thing into really concrete simple parts – I am really interested to see how he does the same with Creativity.